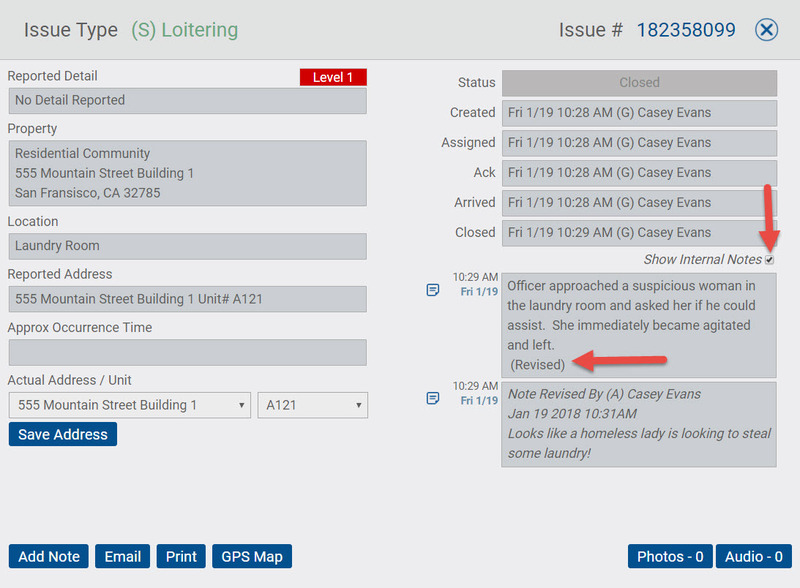 Even though precautions have been put into place on the reporting App to limit the number of mistaken issues submitted by an officer in the field, it has happened occasionally. The trade off of having real time reporting available for immediate review is that once submitted reports typically can't be changed or edited. We have, however, made certain options available to make the reported issues as accurate as possible. One option exists whereby an Admin, Supervisor or Dispatcher can Add Notes to an existing issue to clarify any minor issues. Another option is to Click on the issue ID and then click on the green issue type (Security) named at the top left of the pop up box. A drop down menu of other issues that can be reported for that property will appear and can be changed by clicking go the appropriate issue. An Alert Message will let you know that the issue has been successfully saved. NOTE: Parking and Maintenance issues cannot be edited this way. This is for Security issues ONLY. Another option is to edit a note created by the officer. NOTE: This should be considered only in very rare cases, as the perceived implication is the potential to falsify documents. Therefore this feature is only turned on at the request of the system Admin. 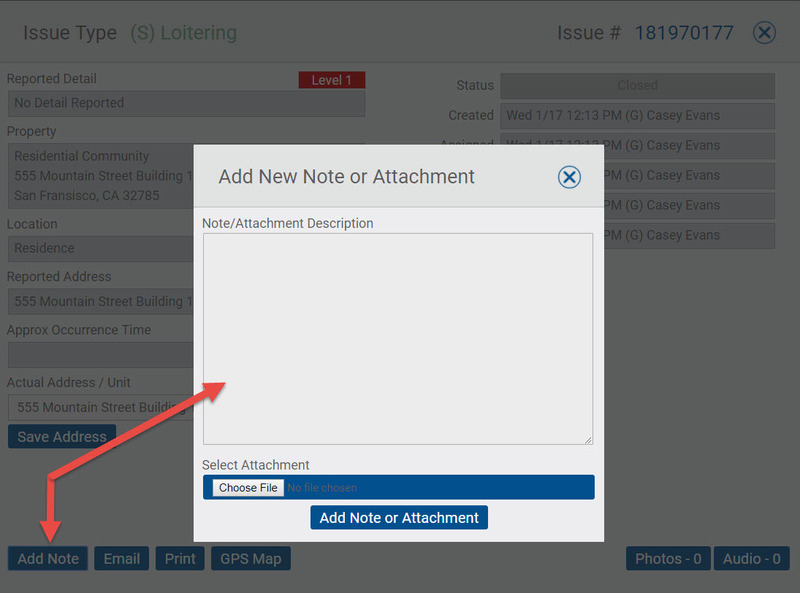 If this feature has been activated: To edit a field note simply click on the issue ID and then click on the note. The pop up box which contains the note as entered by the officer and can be edited. Once edited the note will now contain a (revised) notation. In some rare cases Adding a Note, Changing an Issue Type or Editing a Note hasn't been enough, and in even more rare cases an officer may have even unwittingly raised liability issues. If this is the very rare case for your company, Silvertrac may be able to review and delete certain issues upon request.